I’m happy to reveal the cover for Those Who Came Before, which Flame Tree Press will release on October 10th. People are dying at Strong Lake, and the worst is yet to come. An idyllic weekend camping trip is cut short when Reese Wallace’s friends are brutally murdered. As the group’s only survivor, Reese is the prime suspect, and his story doesn’t make much sense. A disembodied voice warning him to leave the campground the night before? A strange, blackened tree that gave him an electric shock when he cut it down for firewood? Detective Greyeyes isn’t having any of it―until she hears the voice herself and finds an arrowhead at the crime scene―an arrowhead she can’t get rid of. Troubling visions of a doomed Native American tribe who once called the campground home, and rumors of cursed land and a mythical beast plague the strangest murder case she’s ever been a part of. 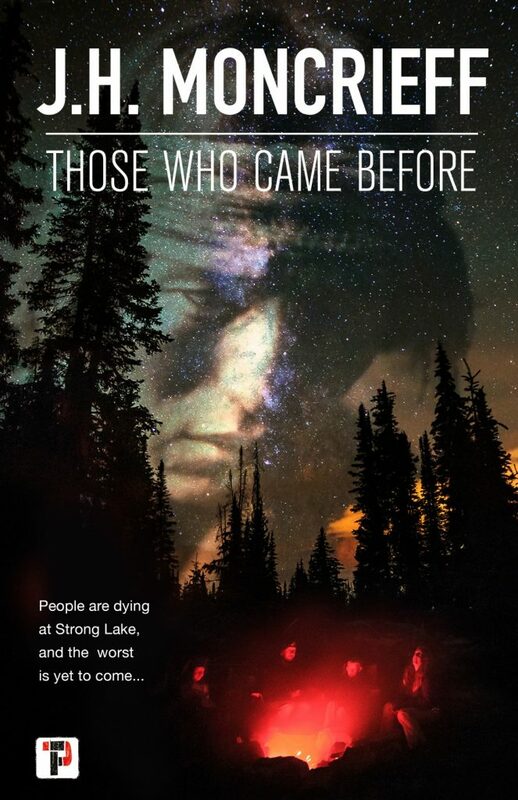 This novel deals with a subject I feel very strongly about–the genocide, murder, abuse, and racism indigenous people experienced–and continue to experience. I come from a nation that is considered to be one of the best places to live in the world, and yet, how we treat our indigenous people–and have treated them throughout history–is nothing short of appalling. As a reporter for an indigenous paper, I visited communities torn apart by youth suicide, stood with people fighting to protect their land from destruction, and cried with women whose babies had been murdered. When the pain got to be too great to be contained in articles, I did what I often do–I wrote a book. 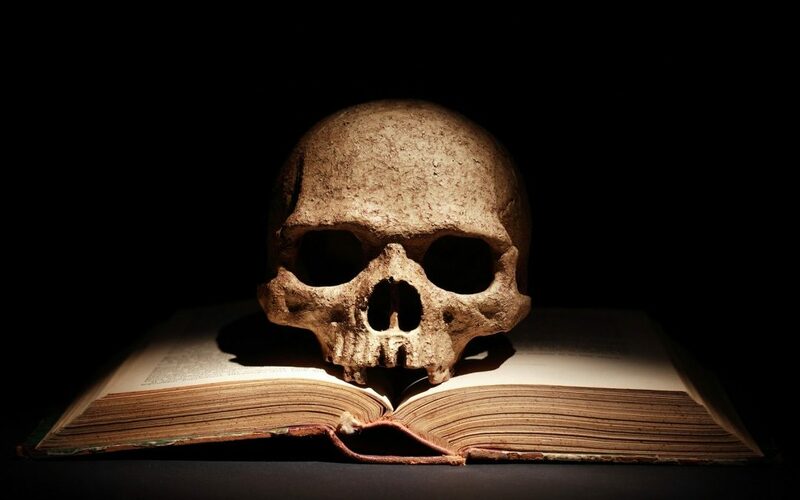 My hope is that, through telling an entertaining, spooky story, I will also educate more people about one of the worst true horror stories of recent history. And, sadly, it’s not confined to history. My greatest insecurity is that I will cause indigenous people more pain by telling this story, though I have tried my best to ensure that won’t be the case, including hiring a sensitivity reader. Now, more than ever, it takes incredible courage to tell the stories that are in our hearts and minds without worrying whether it will offend or cause some kind of scandal. I am always concerned about this, because my books have always been diverse–not by design, but by the stories I felt driven to tell. I first became a journalist because I wanted to fight racism–an odd reason to aspire to the newspaper business, perhaps, but that’s what drove me–and my first byline was for a story headlined Racism Experienced by University Students. Today I teach classes of international students about the damage stereotypes and racism can cause, and still, they will ask me if it’s true they should be afraid of our city’s indigenous people. Some of these students have only lived here a couple of weeks, many only a few months, and already someone has tried to poison them against our First Nations people. It breaks my heart, but I’m glad they ask me, because it gives me the opportunity to present another point of view. With this story, I hope I have honoured Those Who Came Before. I did my best. Have you ever told the story that was in your heart, even though you were scared it might offend someone? How did you handle the fear? PS – I’m still looking for reviewers for Forest of Ghosts. If you’re interested in a free copy in exchange for a review, please let me know in the comments. Kudos to you for admitting to the worries, and for pushing through them. All writers go through this, especially when we write about a sensitive topic, or push the limits/boundaries. But that is what writers do. If we self-censure ourselves, we are no good to ourselves or anyone else. We are homogenized. Which is the opposite of what we should be. You might get backlash, because your sensitivity reader might not be on the same page with this group or that group. Don’t let it get to you. Nothing you write will ever make 100% of the people happy, especially if it’s honest. Comes with the territory. As long as you are honest and respectful, you’re okay. What a powerful post! The current climate makes a writer reconsider how every word and depiction might be viewed – and that’s not a bad thing. It’s makes us step up our game as authors and as thinking, feeling humans. I love to learn about different cultures and communities as a book bonus and yours sounds fascinating. Thanks for co-hosting this month!! Great cover! Took me a second to see the face, but that’s so clever. It sounds like you’ve taken the right steps to tell the story in a way that will honor and bring light to Native Americans. Fantastic cover design! An important story within a story, and one you’ve been courageous in finding a way to get it heard by as wide an audience as possible. This isn’t usually my genre, at all, but I’ll certainly be keeping an eye out for its release. Wishing you great success with it & thanks for co-hosting. Very intriguing story and post! Thank you for co-hosting the IWSG! Your book sounds awesome! Love the cover. Thanks for co-hosting this month. Thanks for co-hosting this month and for visiting my blog. I love the cover and concept of this story and wish you much success with it. Unfortunately, when I write something, I do so knowing it will likely offend someone somewhere just because of my race and gender. Still, there have been a few times when I’ve written something with a specific message and worried that I was capturing that message appropriately. But I think all good, conscientious writers, worry about that. That’s what sets us apart. Telling these difficult to tell stories are the most important ones to tell. Fantastic cover! Thank you for co-hosting today. Powerful cover & post! Racism has no place in our world – at least it shouldn’t. Good post and an issue we all have to think about. I have definitely hesitated about writing some things because of fear, not so much of offending as of just getting it wrong in a stupid way. I suppose that’s a possibility as well, Rebecca. Yes! I’m glad you wrote about Native Americans. Every time I hear about racism and injustice and all that, my first thought is that NO ONE got crapped on worse than Native Americans. I’m very excited that DLP’s fall release is about the Trail of Tears, highlighting some of the horrors those people were put through. Cool cover, J.H. I wish you the best with your story. I, too, see much of discrimination against indeginous people. I’d be happy to review Forest of Ghosts. You did your best, that’s all you can do. Now you just have to release it into the world, let it go. JH, the cover is amazing. I’m sure the story is fantastic and I can’t wait for the release. Write what’s in your heart. There will always be critics. We can only do our best, with best intentions. What a fabulous cover! I didn’t see the face until after Alex mentioned it. Clever. I admire you for writing a book so powerful and so close to your heart. I never have. I tend to play it safe. Thanks for co-hosting this month. Thanks for co-hosting this month! I LOVE the cover. The face in the sky is perfect. I also love your reason for writing this story. I wrote a book that took place in the south right before the civil war and had to ask my blog followers about their thoughts of the use of the n-word. Part of me wanted to avoid it and leave it out entirely, but I knew it was part of the story and historically accurate. In the end I did use it, but kept the number of uses low. I have a WIP that has a mixed-race hero. There’s a lot of pressure to deal with the subject matter tactfully and yet truthfully. I hope I can do it justice. This definitely sounds like a story that needs to be told and I would love to do a review for you. My first two books were true stories many people didn’t want me to tell. At first I was so angry with them for telling me I couldn’t write “that” and once published I was worried about mine and my family’s safety. I would still choose to tell the stories because like you said there are some awful things still happening. Thanks for sharing the origin of your writing career. Best of luck with your book launch. Excellent cover! I write frequently of the Lakota and the Apache. Telling if first person gives me the chance to speak the “mind” of those who were so terribly treated by the white governments. We must speak our hearts in compassion though we are outraged. October 10th? My birthday is the day before. I will be sure and buy your book for a birthday gift to myself and a few others, too. It is a brilliant cover and a very worthy theme. Wish you all the best with it,a nd can’t wait for you to show up on my blog! Your cover is really exciting! And I’d love to read the book. I hear what you’re saying about having concerns when you’re fictionalizing stories of real people. Have you heard of Sensitivity Readers? Someone mentioned them at a conference. I’m not keen on the idea, but it opens some interesting discussions. Thanks for hosting today! Great post. Yeah, that’s a tough place–talking about racism. I’m a mix of minorities myself, including having grandparents who were thrown into internment camps despite being born natural citizens. I think it’s good that you’re writing this book, and I hope it raises awareness. Wonderful cover. I too write about ‘those who came before’ but mine are hundreds of thousands of years ago! Looks like a great book. Hello! Firstly, love the cover. It’s delightfully mysterious and eerie. I have found representations of mental illness ‘offensive’ in the past because fiction has too often made such a mess of it. But I’m always aware that my experience of bipolar disorder or anxiety or whatever is not someone else’s. Not even my sister’s, who shares my diagnoses. I think you have done all you can do, even hiring a sensitivity reader – I only heard of those a few months ago. Unfortunately, we do live in ‘too easily offended’ times, so we must be aware of this, as you clearly are. But we must also represent our own truth, tell our stories, and be open about our motives. What else can any of us do? J.H. that sounds like an excellent book. Please put me on your influencers list. I, too, worry about that. I like stories that cover diverse groups and give voice to people from varied backgrounds. Hiring a sensitivity reader was a great idea. Have you shared it with people who are of the culture you’re writing about? I have a thought about the criticism. Although, often people are telling stories that are not theirs to tell, I believe that comes from a selfish place. When people write stories that are inclusive and have voices from varying backgrounds, they are making efforts in the right direction. I am sad when they get criticized for it. Those statements like, “It’s a start, but not enough,” seem like they stop the forward motion. You have the right intentions, and are a skilled writer. I expect this to be a wonderful book that sheds light on behaviors, attitudes, and history. And, it will also be entertaining and gripping, and I can’t wait to read it! Pre-ordered a copy of this one from Flame Tree. Also, Forest of Ghosts is one of the BEST books I’ve read this year–I highly recommend it to everyone!! Congrats on the new cover and good luck with it. Just remind yourself there will always be someone who gets pissed off about what you write and you can’t please everyone. It sounds like you did your research and homework to make the book the best it can be and not tell the story in an insensitive way. Just released a book and already revealing the cover for the next! You are on a roll, lady! Congrats! I also commend your bravery for writing on a potentially touchy subject, and wish you all the best of luck! 🙂 I know you’re a smart cookie and I’m sure you have and will continue to handle it well. A very moving explanation of why you produced this story J.H. I don’t think you will upset the Indigenous people at all, so no need to worry about that. Beautiful cover! Nothing to be insecure about there. Congrats on your new release! I hope it sends the message you’re trying to convey into some open minds and hearts. While also scaring the heck out of your readers, of course! Thanks so much for co-hosting today. What an interesting concept! Very intriguing. I love how the face appears out of the starry night on the cover…beautifully done. Way to go, J.H.! Oh, this book looks so very good! I’m very glad you’ve been careful with how you tell this story. It’s hard when you are not a member of a community to share their stories without seeming, well privileged. I know you and know you will have been extremely cautious and have written a book that is sensitive, poignant and powerful. Thanks for co-hosting with me. I love your cover. And congrats on your upcoming book release. When I think of some of the books I’ve read in the past, I cringe at how insensitive and racist or sexist. It sounds like you’ve made a real effort to not offend and instead help open a pathway to understanding and making something a little bit better. Congrats on your coming release! The cover is powerful as is your message. I wish you much success! Thanks for co-hosting this month. I think you’re very courageous to write on such a sensitive topic. I’ve told the truth numerous times about my mental illness, despite the stigma mental illness has. I’ve found it therapeutic and have had people come up to me afterward to say they’ve had similar challenges or know someone who has. I figure we’re each other’s clinical material and that we should be more concerned about helping others than focusing on why so-and-so is never happy or why what’s-her-name can’t dig herself out of anxiety. The more people start talking about what’s really going on in their lives, the more I see that everybody has some sort of challenge. Often it’s hidden under a facade, which is really unfortunate because we could all really help each other. Interesting premise with an important cause at the core of it. There are many stories that can be told. Best wishes in getting yours out to the readers. Great cover!! There are some stories that just need to be written. Thanks, Lynda. I agree. Until I moved to my current city, I was in the dark about a lot of these issues. Time to shine some light on them. I think you’ve done all you can to cover your bases in terms of sensitivity issues. Someone somewhere is sure to be offended – there seems to be a cottage industry in fake outrage – but we need authors like you are willing to tackle the tough subjects and not be bullied into silence. You’ve got the cover game sewn up. I loved it so much I clicked on it to see if the book was available. Not yet. I hope I don’t miss it when it’s published. You know how fast life flits by! Thanks, Denise. All credit goes to Flame Tree. I had very little to do with it, save for some gentle advising. I’m glad you’re so interested in the book! You can always follow me on Amazon or here on the blog if you’d like to be alerted to new releases. Your cover is excellent, J. H., and your book is one I would like to read when it is released. I understand the sensitive issues you are raising with your novel. I am working on a memoir about my time among the Ojibwa in northern and northwestern Ontario when I was a girl, and one of my greatest worries is hurting or offending First Nations individuals. I forgot to say, “Thanks for cohosting! I hope you had fun! I can completely understand your concerns, Louise. Your novel sounds like one I’d like to read as well. LOVE the cover!! I also love that you use your gift of writing and the voice you have to work in topics that otherwise might not be addressed. I love the diversity of your characters and the challenges and situations they face always make me take a step back and examine my own life and how I behave towards others. I can’t wait to read it!! Aw, thanks so much, Nikki. I really hope other people feel the same. I’m glad you like the cover too. Kudos to Flame Tree. The cover is a work of art. Your post was exceptional. Thank you, Yvette, and thank you on behalf of Flame Tree’s cover artist. Wish I knew the name. Great cover and what sounds like a stellar story. I can’t wait to read it! Thanks, Hunter! I really appreciate your consistent loyalty and support. First of all, thank you for this post. You approached the topic head on, as you always do, and I appreciate it! Whether telling stories verbally, in song or in prose, we storytellers always have to be aware of sensitivities, yet that can be difficult to balance against the integrity of the story sometimes. Thank you for sharing your thoughts, and I look forward to reading the book!! Do you mind if I share your article on Facebook? Thanks, Kelli. I’m glad you liked the post, and you’re free to share the article. I’m happy it resonated with you. it is hard, and very frightening, to write about controversial issues. I hate that authors are confined to write today’s politically correct lingo instead of the historical language and issues of the era. I did not say that well, but hopefully you get the idea. It just takes away from the legitimacy of the hero’s, villains, and general population. It is sad that Tom Sawyer is being re-written to reflect the politically correct verbiage of today. Now I sound racist. I’m not. I’m read for review for you, but I don’t have the time to “read” during the week, and don’t have any weekend time to just sit. I need audio books for the drive. I did listen to the first book, City of Ghosts, but haven’t got around to writing the review. There are a couple places that cause me to give less than 5 stars, and I worry about publishing my complaints, especially so close to the new publication. I had no idea Tom Sawyer was being rewritten! Seriously? That seems like overkill to me. I’m sure PoC more than most are well aware of the language that was used in those days. More good can be done by discussing why it was wrong than pretending it never existed in the first place. As for reviewing my books, no one is under any pressure to review, especially if they didn’t care for them. JH, the more I read about you and from you, the more you impress and inspire me. You have experienced so much in life and you have so many stories to share. I totally understand your insecurity with this one, because even if you try your utter best not to offend anyone or do something “wrong”, there might (and probably will) be people out there who read into things or take certain stories, writing, focus, publicity… the wrong way. I applaud you for writing about what matters most to you and your newest release will touch many hearts, inform a wide audience and you will certainly make a difference. Speaking up about any subject is courageous, especially these days when certain people like to lash out, especially on social media. You have to have thick skin. But, you know that already. I try to be honest about what I think and what I write about. I think that’s all we can do. You did everything to be sensitive as well. And you know from experience what you’re talking/writing about. I can’t wait to add this book to my reading list! The cover is great as well. You’re right that we can’t please everyone, just tell the stories that are in us to tell. That cover is sure eye catching. And the book sounds intriguing. Congratulations and best of luck to you. Thanks for co-hosting this month. You’re very welcome, Beverly. Glad you like the cover, but I can’t take much credit for it. 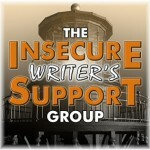 Thanks for cohosting the IWSG question for April. You book sounds both terrifying and deep. All the luck with the new release. You have strong reasons to share your stories. More power to you. Thanks, Victoria. I appreciate the kind words. I love the face in the night sky. Beautiful. All the best with your release! Thanks for co-hosting. Hopefully your sensitivity reader was able to put you on the correct path in telling this story. Love the cover. Had to do a double take because I missed the figure in the sky. And a powerful post too. It’s true and saddening the treatment of this country’s indigenous people by our own government. Glad you pushed through in telling this story and for using a sensitivity reader to better paint your story. And without falling on damaging stereotypes.